Welcome to Mint Masters, our website is under construction. See our PDF catalog for all of our products. 2" Stock medal available in antique finished brass (goldtone), nickel-silver (silvertone) and copper (bronzetone). Has an engraveable backside. We stock neck ribbons and pin drapes in several colors. If you do not see the color you need please contact us and we’ll be happy to see if we can special order for you. Imprinted neck ribbons can also be special ordered. Standard jump ring color is goldtone. Engraving Text Line 1 (25 Character Limit) ? Engraving Text Line 2 (25 Character Limit) ? Engraving Text Line 3 (25 Character Limit) ? Engraving Text Line 4 (25 Character Limit) ? Engraving Text Line 5 (25 Character Limit) ? 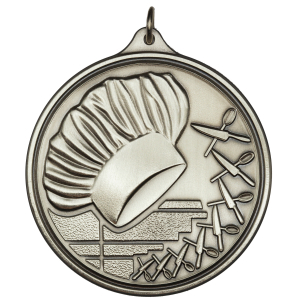 Stock medals ship 1-2 days from order, larger quantities may require additional time for us to manufacture them. Assembly and engraving will require extra time as well. Please be sure to indicate the date product is needed. We will contact you if we cannot meet that date.